Manolo says, here is the column of the Manolo that appeared in the Express of the Washington Post. Please tell me your take on the emergence of the flip-flop as the shoe of choice for any and all occasions. Manolo says, Ayyyyyyy! Like the Bubbles, the Manolo he is indeed most offended by the ubiquity of the rubber flip-flop. It is as if the whole world it has gone mad for the shower shoe, wearing what is suitable only for the locker room onto the mean and filthy streets of the big city. But fear not, the Manolo he is here to guide you. 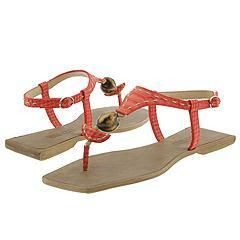 If you must wear the flat sandal he recommends to you the Kenzo 253157. This happy shoe it will cheer you with its most unusual and stylish design. Even the better, your feets they will be cool, comfortable, and protected from the most vicious of the urban poptops. Manolo says, the Manolo he must thank his internet friend the Bubbles for the most amusing and timely question. And now the Manolo he asks his readers in the Washington of the D.C. if they enjoyed the column of the Manolo to write to the editor of the Express of the Washington Post to tell this person how much they liked reading the Manolo’s humble column. Of the course, if you are not in the Washington, it cannot hurt to email your local papers to tell them of the Manolo and his many fans. Manolo says, and then you grab Pontius Pilate by the throat. Manolo says, Ayyyyyy! The life it imitates the Manolo. And now, the joke of the Manolo it is the real rumor! Charlotte Church – of Scientology. Manolo says, Ayyyyyyy! Today, the Manolo he is now the newspaper columnist! If you are in the area of the Washington, District of the Columbia, you must get the copy of the Washington Post Express so that you may read the Manolo’s column on the shoes. In it he discusses, briefly, the flip-flops. He even reccomends the pair of the Kenzo sandals! Manolo the Columnist? Truly this it is the best of all possible worlds. Manolo says, here you see the most unusual sort of the shoe from the Pucci, something perhaps understated, something not with the usual festive patterns of the Pucci. 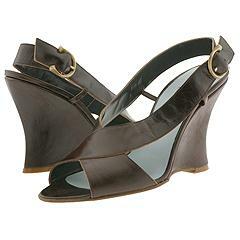 This it would be perfect for wearing with the deep brown suede skirt on the first cool afternoon of the early fall. Manolo says, the Billy Idol he has discovered something wrong! Manolo says, and here the Manolo he risks reigniting the entire Kelly Clarkson’s Belly controversy, but there is the most amusing article about the too-tight pants and the midriff bearing fashions in the Daily News of the New York, and the article it includes the picture of the Kelly Clarkson spilling bounteously over the top of her pants. Christina Aguilera is a reformed muffin topper, often spotted onstage during her wild-child period in a pair of badly fitting pants accessorized with an ample tummy roll. Kelly Clarkson is also a repeat offender. “Especially when Kelly first won ‘American Idol,’ the muffin top was the one thing that was common in everything she wore – nothing fit right.” And her tummy can still be seen rising over the pants she’s poured herself into on tour this month. Of the course, this it is exactly what the Manolo he said two of the months ago. Manolo says, Ayyyyy! Help! I’m caught in the curtains, again! Manolo says, Ayyyyyy! The Manolo he will have to make the trip to the Chicago!